Ruth was asked by Buzz Feed of New York – a fabulous on-line magazine to give a step- by-step guide to making bagels!!!!!!! What a fantastic honour showing the New Yorkers how to make bagels. We made them first as a practice run and then we made them again – ha crazy work three weeks before the Passover – thank goodness for a massive freezer and lovely wipeable tops. The Bagel marathon as it is now affectionately termed was a resounding success – and the recipe from Warm Bagels and Apple Strudel. Well those babies rose and smiled at us. The whole project worked perfectly – like a dream – apart from the lens cap falling into the proving mixture. Anyway here are the exclusive and fabulous pictures. Watch how to make them and try them. You just need to allow time on two consecutive days and you will be thrilled with the results. Maybe you could throw and bagel party offering bowls of egg and onion – free range of course, luscious veggie cheeses or the vegan option of different hummus and maybe guacamole and other lovely dips accompanied by tempting salads or soups and plenty of delicious veggie wines and juices. For a more in depth look we will post the Buzz Feed article at the end of the month but here's a few photographs to tempt for the future. Today the sun is shining at long last and spring looks as if it may arrive and bless us at last. It has been a long bitterly cold winter and it feels good to taste the warmth of a little sun on our shoulders. And with it arrives the Passover or Pesach. Jewish women traditionally moan about the heavy work-load and certainly cleaning the house of every grain of unleavened bread and changing all the dishes then cooking all the food from scratch is a huge undertaking. But Pesach arrives with the trees full of spring blossom, nodding dainty tete a tete daffodils, clutches of bright forsythia hug grateful gardens along with the bright flamboyance of camellia basking in Technicolor hues and it is such a glorious time of the year. This year we are welcoming two wonderful non- Jewish friends to our Seder table – one vegan. We thought we’d start with the mandatory egg in salt water and possibly give them some dainty baby potatoes in the same salt water, a lovely home-made chunky vegetable soup with knaidlech – and an attempt to make knaidlech without eggs, then mushrooms in red wine which are seriously good, the sauce is delicious. Plus a generous vegetable tagine studded with moist black and green olives and almonds for crunch and a good protein hit. Normally we would serve that with couscous or throw in some chick peas but even though my husband is Sephardi and we do use pulses we try to remain Ashkenazi for the Seder. So alongside the vegan dishes will be a Spinach and Leek Roulade from the book which is wonderful as it can be prepared in advance and frozen and tastes like a dream and a Carrot and Almond Bake which Ruth invented years ago when her son first became a vegetarian and she wanted to give him something tasty. With its rich golden colour and light soufflé texture it has been a traditional family favourite and perfect for all the family. This year we will have Chremslach which have been mentioned and step by step photographs to follow. And finally pots of deep pinkish Chraine – horseradish and beetroot spread which is needed for the Seder and delicious with all the fresh Passover foods. If you make nothing else this Passover please try our Chraine recipe from the book. You will be soo rewarded and we promise you will never buy another pot again. We will finish the meal with poached fruit, a Frangipane and Blackberry tart, almond, and coconut meringues, cinnamon macaroons, coconut pyramids and homemade chocolates with masses of healthy celebratory discussion and hopefully plenty of laughter. And yes we are exhausted but when we look around the table at the polished silver set on the freshly laundered cloth and the shining faces and we taste all the freshly made food, we will all experience that ultimate sense of satisfaction and achievement. Chag Someach and enjoy all the recipes from Warm Bagels and Apple Strudel or if you are in America – Jewish Traditional Cooking. Well it all happened but much to our surprise, after Ruth submitted to the Guardian, she won their ‘Get togethers prize’ and the Guardian came to our Pesach celebrations. It was the most perfect occasion despite the whole thing being dogged by illness. Our lovely vegan friends went down with a ghastly lurgy and at the last minute couldn’t come. Our daughter/granddaughter Jasmine had a tummy bug and it looked as if she wouldn’t manage it. The first Seder night, Phoebe choked on a piece of matzo and why is this night different from all other nights? Well Ruth herself suffering from a middle ear infection fainted a week before, summer-salted over off a chair onto the stone kitchen floor and managed to land on her neck, head and back and fracture a vertebra. But the show must go on and on it did. On the night, faces shone, Mervyn recalled the story with glorious aplomb and the whole thing was just lovely. We desperately missed our vegan friends and were so sorry they didn’t have their tagine. But certainly we will make that again as it is the perfect filling tasty food that sits in the oven patiently until the service is finished and well just becomes more tender and unctuous. Here is the link to the guardian article. To make the Vegan Tagine we gently sweated 3 large onions with three large well cleaned leeks cut into rings and simmered until they were softened in a little oil and just beginning to colour. Then we added, 1 tablespoon paprika, 1 teaspoon cumin, 1 teaspoon ground coriander, ¼ teaspoon hot spiced paprika, ¼ teaspoon ground ginger, ¼ teaspoon ground black pepper and waited until the veggies were almost cooked before adding the salt. 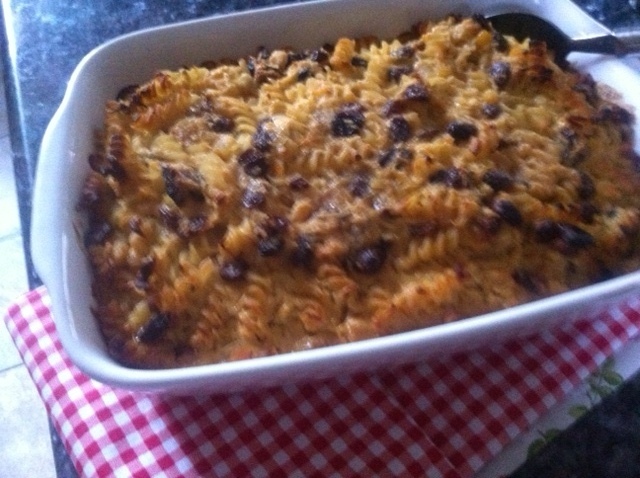 We added a mixture of potatoes, courgettes, carrots, butternut squash and little swede which we cut chunky and placed in an enormous roasting pan half topped with a vegetable stock plus approximately 10 large green stoned olives and 200 grams of whole skinned almonds to add crunch and protein. We placed it in the oven on no 4 gas mark 180 C and left it to simmer for hours – at least 2 and gradually the mixture softened and became just the most delicious meld of vegetables and spice. We promised to make that soon with photographs so that you can see how the recipe is put together. And now with the Passover over – a sigh of relief – how many ways can you cook a potato? We return to our lives. Ruth was asked by Zester Daily – a fabulous magazine from Los Angeles asked Ruth the write a provocative piece in their Soapbox section on Jewish food, in conjunction with the launch of her translated American book – Jewish Traditional Cooking. She said that the Ashkenazi Diet had to become healthier and adopt the Sephardi way of eating and it seems that the piece was very well received as book sales shot up! And onward and upward. We have managed to have three recipes in the Guardian Cook section, on the 9th of February, our Fabulous Florentines almost won the Moreish section. We make these luscious Florentines at all times of the year as they are such a moreish generous accompaniment to go with coffee or brandy at the end of a meal. However they are soo luscious that they are suitable to serve at any time. In a large pan put the margarine, milk and icing sugar and gently simmer for approximately 5 minutes or until the mixture begins to change colour slightly. Now add the rest of the ingredients, ready prepare except for the chocolate. Combine well. Remove from heat and leave to cool. Spoon teaspoons of the mixture onto the baking parchment leaving approximately 2cms all round to spread. Cook for approximately 10 minutes or until golden brown. Remove and leave to cool. Place a glass bowl over a saucepan with hot water. Add the chocolate and stir until melted. 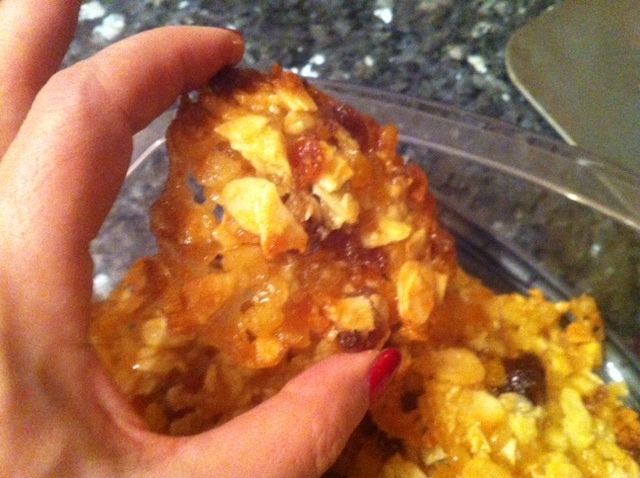 Carefully dip the bases of the Florentines in the chocolate and leave upturned to almost set. Then run the tines of a fork over their bases to make a design. Sprinkle with popping candy if desired and serve with coffee and plenty of laughter. Variations Try substituting half the almonds with pistachios which have been processed or chopped lightly to choc-chip size. Grated tangerine or orange peel adds a bright change to the morish flavour. Apologies here as the photographs are only from a mobile Phone. Sarah has now taken up the photography gauntlet and you will see that the photos are now taken with her Dad’s posh digital camera. It all takes twice as long but we are thrilled when the shot looks professional. Goodness am I kvelling? 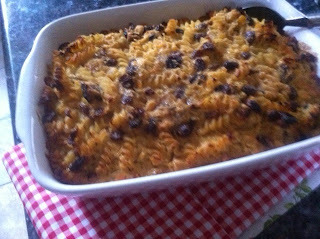 Then on the 2nd March our Ultimate Lockshen Pudding or Noodle Pudding almost won the Macaroni section. The recipe was adapted from the recipe in Warm Bagels and Apple Strudel and is well worth trying. 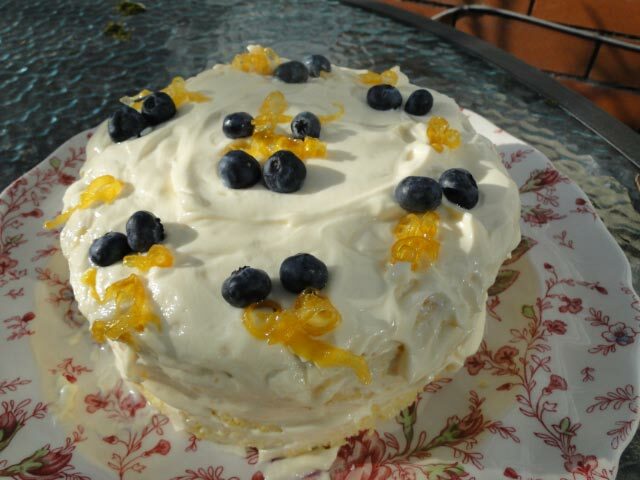 Again on the 6th April Ruth’s recipe for Limoncello, Lemon and Blueberry Cloud Cake – in the under 500 calories, a definite low-cal original was in the running for the first prize but pipped to the post why? Felicity Cloak says ‘Ruth Joseph’s light as air cake lost out on the winning spot this week as I ate a quarter in one sitting completely defeating the purpose so I’ve gone for another person’s entries – gutted! But thrilled at the same time to get soo close. We will soldier on and keep competing.